Jewish Home MK slams Education Corps document, according to which loss of 'checks and balances' in rule of law caused Holocaust. 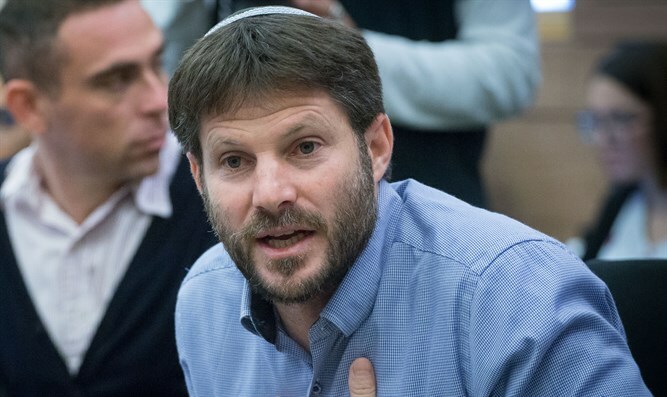 MK Betzalel Smotrich (Jewish Home) slammed the educational approach of the IDF Education Corps, according to which the loss of "checks and balances" in the rule of law led to the destruction of six million Jews in Nazi Germany, something which is liable to lead to another Holocaust. "The Holocaust was caused by anti-Semitism and hatred of Israel. Period. Not because of any 'loss of checks and balances' or 'erosion of the democratic apparatuses and the rule of law', Smotrich responded to official IDF documents revealed on Arutz Sheva. "This disgraceful document is Holocaust denial and the harm done to the memory of the six million Jews who were murdered and slaughtered, and burned alive in sanctification of G-d’s name by the Nazi oppressor is embarrassing and demands correction,” the MK stressed. The comments come after the IDF Education Corps, ahead of Holocaust Martyrs’ and Heroes' Remembrance Day, distributed a booklet to IDF commanders, including, among other things, "the educational conception of Holocaust remembrance" as understood by the Education Corps. The document shows that the IDF teaches its soldiers that the Holocaust could take place tomorrow morning, in Israel in 2018, if we do not maintain moral boundaries, or if we harm the system of checks and balances of the rule of law. "The Holocaust is a conspicuous warning sign facing every society about the place to which it can deteriorate without setting clear moral boundaries and respect for every human being," it says. The document also claims that the "deterioration of the rule of law and the erosion of democracy" are what led to the destruction of the six million Jews in the Holocaust.